Sidney, N.Y. June 2018 – Amphenol Industrial Products Group, a global leader in interconnect systems, announces that its SurLok Plus line is now certified to UL 1977 in all sizes, including 5.7mm, 8.0mm and 10.3mm. SurLok Plus is a high current compression lug designed to meet the needs of energy storage for commercial and residential battery storage systems, as well as electric and hybrid electric vehicles. 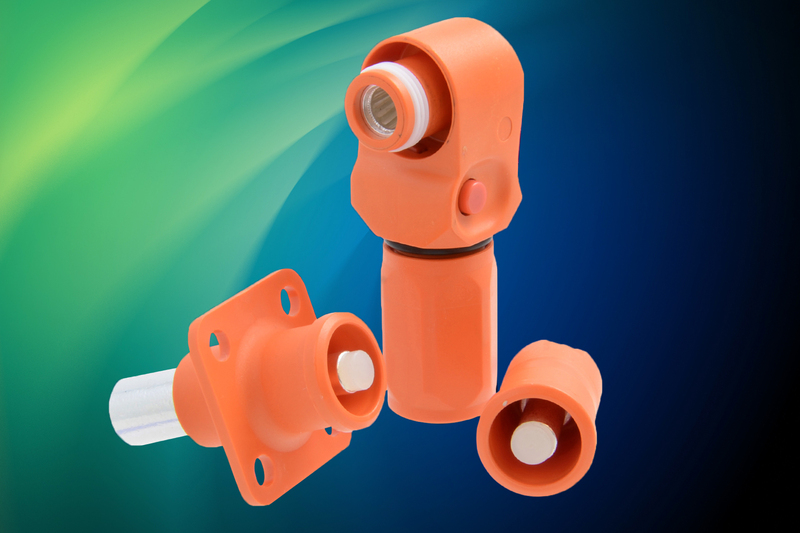 This quick connect and locking system is available in 3 termination styles including crimp, busbar lug and threaded post. Used by inverter and power supply manufacturers, SurLok Plus is optimized for battery pack connections from 50 A to 400 A using a touch-safe interface. This robust, low profile, right angle design, RADSOK connector is quick mating and significantly increases amperage while reducing insertion force, temperature rise and voltage drop. SurLok Plus features a flexible design that accommodates dimensional constraints. It is IP67-rated and comes in both sealed and unsealed versions. The sealed version offers an excellent environmental sealing to protect the system from the elements. Delivery for SurLok Plus is 8 weeks ARO. For more information, please visit http://www.amphenol-industrial.com or e-mail visam.chen@amphenol-industrial.com. READER SERVICE INQUIRIES: Please forward all reader service inquiries to Visam Chen at Amphenol Industrial Products Group, Amphenol Corporation, 40-60 Delaware Ave, Sidney, N.Y., 13838-1395; e-mail: visam.chen@amphenol-industrial.com; Web: www.amphenol-industrial.com. Editor’s Note: Amphenol Industrial Operations, headquartered in a 307,000 square foot facility in Sidney, N.Y., provides a full range of high reliability power/signal connectors and interconnection systems specifically for the industrial markets including rail/mass transit, process control, automotive manufacturing, heavy equipment, wireless base stations and petrochemical/power generation. Products include ruggedized-for-industry cylindrical, fiber optic, rectangular, and industrialized versions of Amphenol’s MIL-DTL-5015 cylindrical, MIL-DTL-26482 miniature cylindrical and GT reverse bayonet cylindrical connectors. It employs more than 900 people and is ISO9001, TS96949 and MIL-STD-790 certified. Amphenol Industrial Operations is a division of Amphenol Corporation, Wallingford, CT, one of the largest manufacturers of interconnect products in the world, with year 2017 sales topping $7 billion. This entry was posted on Monday, June 18th, 2018 at 2:06 pm and is filed under Advertiser, News.